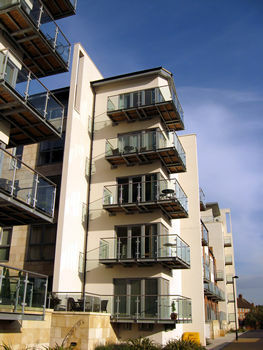 The Hungate area has new residents, in these buildings completed since I was last up this way. When I started this website in 2004, one of its earliest pages involved a wander through the remnants of this formerly industrial area. 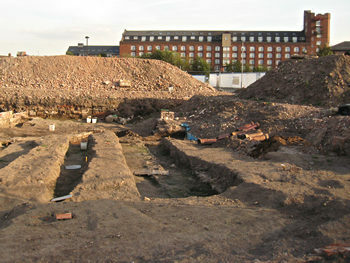 Most of the old buildings have been demolished in the intervening years, and an archaeological dig occupies part of the cleared area. This first phase of redevelopment is a dramatic change to at least part of the site, changing the skyline, and producing different reflections in the waters of the Foss. The tall chimney on the skyline, over the other side of the river on Foss Islands Road, is still just visible, over the top of these buildings. (It seems to be known these days as ‘Morrisons Chimney’, since the supermarket built a store alongside it.) It’s a useful landmark for orientating yourself, in an area so much changed. 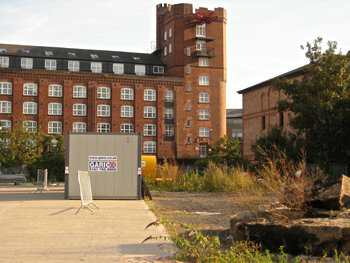 It’s difficult to remember where the old Derwent Coachworks building was, six years ago. The basic road layout remains, but the redeveloped end of the site has new streets: Palmer Street, Foss View, Black Horse Lane and King’s Pool Walk. It’s all very bright and clean and tidy around the new buildings. 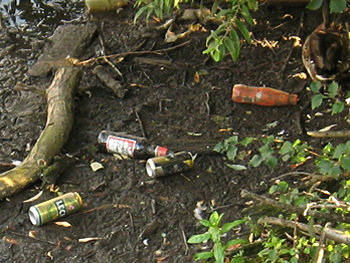 Beneath them, there’s supposed to be a sanctuary for wildlife, on the banks of the Foss, but it’s also a sanctuary for litter, it seems, just as the Foss always was. 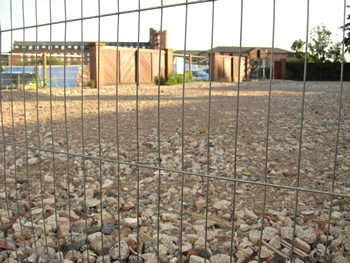 The new development also overlooks a large empty space, with trenches and vast piles of earth and rubble. On the skyline, still, the impressive bulk of Rowntree Wharf, another useful landmark, and, like the chimney, a reminder of our industrial heritage. The old weedy areas I photographed here a few years ago were supporting thickets of buddleia, and the occasional splendid foxglove flower. There are no foxgloves now, but the buddleia are creeping back, on land still undeveloped. The area close to Peasholme Green and Stonebow has also been cleared, with the ambulance station and the Peasholme Centre both removed since I was last here. The demolition of the Peasholme Centre – a hostel for the homeless – was particularly controversial, as it was a fairly modern building and certainly not derelict. 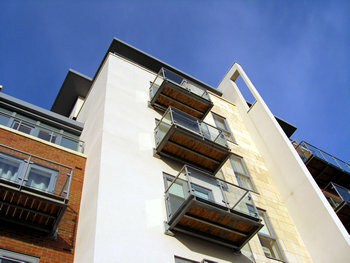 A replacement facility has been built on Fishergate. Metal fencing here, but much of the site is surrounded instead by wooden hoardings, as it has been since my visit in 2007. These white-painted boards have been used to display artwork, in the Hungate Outdoor Art Exhibition, definitely worth a look. In case your travels don’t take you to the Hungate area of York, I’ve compiled a page on this exhibition. 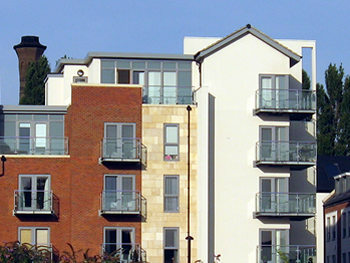 Previously on this site: the Hungate area in 2004, in 2006 and 2007. Also the page By the Foss – 1990 and 2004 – photos from the opposite bank of the Foss, taken in 1990, including views of this area before clearance.